The entryway at Sony Pictures Entertainment in Los Angeles. 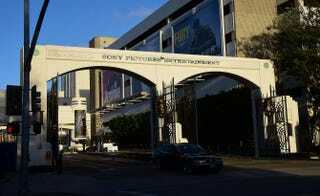 Early in December, Sony Pictures denounced a “brazen” cyber attack it said had netted a large volume of confidential information, including movies as well as personnel and business files, but the company played down a report that North Korea was behind the attack, saying it did not then know the full extent of the security breach. North Korea on Saturday proposed an investigation with the United States into the hacking attack against Sony Pictures Entertainment, warning of “serious” consequences if Washington rejects a probe that Pyongyang says will clear it of orchestrating the breach, the Associated Press reports. Analysts viewed the proposal as a charade by North Korea to try to show sincerity, even though it knows the U.S. side would never accept its offer of a joint investigation, the news outlet says. The request comes after U.S. officials on Friday blamed North Korea for the hacking, citing the tools used in the Sony attack and previous hacks linked to that country, and vowed to respond, the report notes. The breach, which revealed tens of thousands of confidential Sony emails and business files, resulted in threats of terror attacks against U.S. movie theaters if they screened The Interview, a comedy about a plot to assassinate North Korean leader Kim Jong Un. Sony canceled the Christmas release, drawing widespread criticism in the United States. On Saturday an unidentified North Korean Foreign Ministry spokesman in Pyongyang proposed the joint investigation with the United States, saying that North Korea knows how to prove it is not responsible for the hacking, AP writes. He also said that Washington was slandering Pyongyang by spreading unfounded rumors, the site says. “The U.S. should bear in mind that it will face serious consequences in case it rejects our proposal for joint investigation and presses for what it called countermeasures while finding fault with” North Korea, the spokesman said in a statement carried by the official Korean Central News Agency, according to AP.